NEW YORK (June 30, 2016) -- The 2016 Summer Fancy Food Show, which ended Tuesday, was the largest in exhibit space since it was established in 1954. More than 2,670 exhibitors filled the halls of Javits Center in New York with the latest in specialty food and beverages from across the U.S. and 55 countries. Owned and produced by the Specialty Food Association, the show ran June 26 – 28. It is the largest such marketplace in North America. More than 47,000 specialty food professionals were in the exhibit halls, which spanned the equivalent of six football fields. "The show is the place to be to discover the latest in specialty food and what's next for stores and restaurants," says Laura Santella-Saccone, the Association's chief marketing officer. "Record sales for specialty food have contributed to the strength of our show." 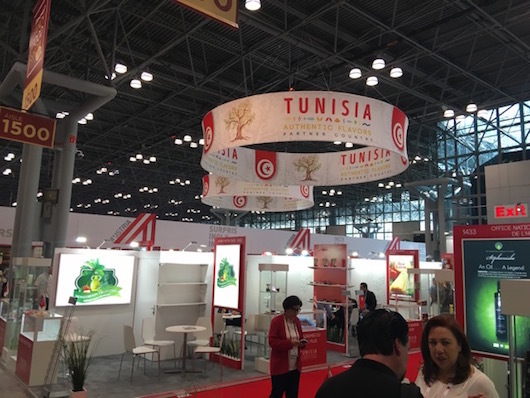 Offerings were plentiful from Italy, the largest international exhibitor, and Tunisia — the show's official partner country sponsor — was front and center with olive oil, harissa, dates, and many more North African specialties. Here is some of what to watch for on store shelves as noticed in the packed exhibit halls by the Specialty Food Association's panel of trendspotters: "Everything bagel" is not just for bagels anymore. The flavor cropped up in yogurt, nut mix, mustard and hummus. New twists on classics included savory yogurt, spicy granola, chocolate chip hummus and pepper-packed honey. Coconut and pumpkin were everywhere, as was maple. Elderflower made a strong showing in teas and bottled drinks and pickled products were plentiful. Show highlights included Shelf Showdown, a specialty food pitch competition where four first-time exhibitors presented their products to a panel of seasoned specialty food buyers. The winner: lawyer turned farmer and meat entrepreneur James Faison of Milton's Local won a promotional package from the Specialty Food Association for his uncured bacon sausage. The 2016 sofi Awards were prominently showcased at the show's opening night party, and in special showcases. The sofi Awards are considered the "Oscars" of the specialty food industry. This year there were a record 3,200 entries, 28 winners and 100 finalists. Learn more. The show had a full education program with industry experts speaking on topics from how to get started in the specialty food business to a futurist panel looking at ideas that will change how we produce, sell and eat. The event ended on a high note. Exhibitors donated more than 100,000 pounds of specialty food, enough to fill six tractor-trailers, to the Specialty Food Foundation, which in turn donated it to City Harvest, New York City's pioneering food rescue organization.